Best facts, figures, and research on Iranian domestic politics. Iran is a hybrid political system on two levels. It is a mixture of (a) theocracy and republicanism, on one hand, and (b) democracy and authoritarianism, on the other. In the first instance, as an Islamic Republic, the political system contains both theocratic and republican elements. Instead of separating religious from political authority, the Islamic Republic has merged them across every formal political institution. At the head of the political order resides the Vali-ye Faqih (Guardian-Jurist, or popularly known as the Supreme Leader) who is an ultimate arbiter for the affairs of the country and must be a qualified legal scholar (faqih). The sovereignty of the state is based on God and the vicegerency of God as reflected in the position of the Supreme Leader. All political institutions of the country are thus based on a notion of religious legitimacy. Yet, Iran is also a republic, with popular elections and the popular will critical to the legitimacy and function of the country’s political system. All institutions are either directly or indirectly determined by popular elections, including the Parliament (lit. “Islamic Consultative Assembly”; Majles-e Shora-ye Islami), the Guardian Council composed of religious and constitutional legal experts appointed by the Supreme Leader and Majles respectively, and the Assembly of Experts composed of senior clergy who are popularly elected and who appoint the Supreme Leader. Theoretically, this effectively results in a system of checks and balances in which the Iranian people elect representatives based on the religious foundations and filters of the system, and the Iranian political and religious elite carry out policymaking based on their interpretation of religious and revolutionary values. The Supreme Leader (now Ayatollah Ali Khamenei) in turn exerts ideological and political influence on the governing structure of the system under the guardianship of clerics who shadow every major function of the state. In the second instance, the Iranian political system is hybrid in that it mixes democratic and authoritarian features. On one hand, the country has meaningful competitive elections for high political office with results largely being unpredictable and uncertain. Voting is real, and outcomes can impact the balance of power between different factions in government and alter policy platforms across economic, cultural, and political dimensions. On the other hand, less than democratic conditions exist regarding competition for state bodies, such as the Assembly of Experts that chooses the Supreme Leader and that only includes high clerical leaders. Competition is also constrained for those wanting to run for executive or legislative office as the Guardian Council can vet candidates and deem them ineligible to run. As a result, democratic chains of decision making run through the purview of religious authorities, also reflective of the larger theocratic-republican blend of political order. What does Iran’s power structure look like? The Supreme Leader, Ayatollah Ali Khamenei, has the final veto power on major policy decisions, either directly or through a network of groups appointed by him. He also serves as commander-in-chief of the armed forces. He picks six of the twelve members of the influential Guardian Council and appoints the head of the judiciary. The Supreme Leader is in turn appointed and conditionally supervised by an elected body of high religious clerics, known as the Assembly of Experts. Iran’s President is the country’s second-most important leader. Unlike the supreme leader, he is elected for four years and is limited to serving no more than two consecutive terms. While the president is often the public face of the Iranian government, his actual power is circumscribed by the constitution and other institutions such as the Supreme Leader. Nonetheless, the president helps direct much of economic, domestic, social, and foreign policies and represents Iran in many international forums. As Khamenei’s affirmations of Rouhani’s negotiating team exemplify, the Supreme Leader is not always opposed to delegating authority on national security matters. The Guardian Council is a powerful body that assesses the legality of laws passed by parliament and determines which candidates are unfit to run for public office. It consists of 12 legal experts, six qualified in matters of Islamic law appointed by the supreme leader and six in constitutional law nominated by the judiciary and approved by Iran’s parliament. The Guardian Council can veto parliamentary bills considered to be in violation of Iran’s constitution and/or Islamic law. Iran’s parliament, known as the Majles, is a unicameral legislature comprised of 290 members who are elected to four-year terms. Parliamentarians draft legislation and approve the country’s budget. The Majles also has the power to interpellate and impeach the President and members of his cabinet. The Assembly of Experts is an elected 88 seat body of senior religious clerics that is charged with choosing and conditionally supervising the Supreme Leader. Members usually serve for eight years and must pass a religious exam to stand for election. The Expediency Discernment Council of the System is a body of elites that is charged with resolving gridlock between the Majles and the Guardian Council. The Expediency Council also serves in an advisory position to the Supreme Leader and has been delegated some authority from the leader in supervising the branches of government. Members serve for a 5-year period and are appointed by the Supreme Leader from across the political spectrum of Iranian factions, with the current council being comprised of 37 individuals including many of the top statesmen of Iran including the heads of all three branches. The president presides over the Supreme National Security Council, comprised of approximately 12 individuals, including the heads of the three branches of government, heads of the armed forces and IRGC responsible to the Supreme Leader, and key power ministries associated with the president. In September 2013, President Rouhani shifted responsibility for Iran’s nuclear negotiations from the Supreme National Security Council to the Foreign Ministry, making Foreign Minister Javad Zarif the chief nuclear negotiator. Rear Admiral Ali Shamkani serves as the council’s current secretary. The Islamic Revolutionary Guards (IRGC), formed after the 1979 revolution to protect the regime against external and internal threats, is the country’s premier security institution, distinct from Iran’s military. It is subject to the direct purview of the supreme leader, though Maj. Gen. Mohammad Ali Jafari oversees the organization’s day-to-day matters. The IRGC reaches every town through its oversight of the Basij, local volunteer paramilitary units comprising mostly young Iranian men and women across a variety of sectors, including physicians, students, farmers, engineers, and nomads. The Guards preside over a vast power structure and are staunchly loyal to theocratic elements in the regime, though it is not a monolithic organization. Who's who in Iran's political system? As Iran’s head of state and commander-in-chief, Ayatollah Khamenei has not only constitutional authority but also significant tangible influence over all branches of the Iranian government. He is committed to securing the survival of Iran’s theocracy. Khamenei, who became supreme leader after Ayatollah Ruhollah Khomeini’s death in 1989, frequently condemns American sanctions for "crippling" Iran, which he believes are aimed at removing him from power. Despite his suspicions of the West, Ayatollah Khamenei has seemingly given President Rouhani and Foreign Minister Zarif permission to negotiate a nuclear deal in an effort to remove all sanctions. To the surprise of many, moderate cleric Hassan Rouhani cruised to victory in the first round of Iran’s presidential elections by garnering nearly 51% of the vote in June 2013. While long a part of the establishment—including as an influential figure in the Iran-Iraq war and secretary of the Supreme National Security Council—he campaigned under the slogan “moderation and wisdom,” advocating policies to reverse the economic decline and international isolation overseen by his predecessor. As Iran’s chief nuclear negotiator from 2003 to 2005, Rouhani agreed to suspend uranium enrichment and permit more intrusive IAEA inspections—an accord that was swiftly discarded after Mahmoud Ahmadinejad gained power and replaced Rouhani in 2005. After his election, in an allusion to Iran’s contentious relations with the West, Rouhani spoke of “a chronic wound” and said, “There should be a change of direction in order to turn a new page in this unstable relationship.” In the highest-level contact between American and Iranian leaders since 1979, Rouhani held a historic phone call with President Obama at the tail end of the UN General Assembly meeting in September. President Rouhani has personally expressed commitment to the current P5+1 negotiations, yet he has pledged that Iran will never relinquish its right to enrich uranium. Qassem Suleimani is a shadowy figure who has for 15 years commanded the Iranian Quds Force – a specialized, elite branch of the IRGC that is, as Dexter Filkins writes, “roughly analogous to a combined CIA and Special Forces.” Though subject to sanctions from the US Treasury Department for abetting terrorism and aiding the Assad regime, Suleimani continues to direct Quds Force operations throughout the Middle East, including Iraq and Syria, and beyond. Who’s who on Iran’s nuclear negotiating team? A fluent English speaker who spent nearly half his life in the United States, Mohammad Javad Zarif was appointed by Rouhani to serve as Iran’s foreign minister and chief nuclear negotiator. He is a long-time diplomat and professor. While Iran’s ambassador to the UN between 2002 and 2007, Zarif was a primary player in the development of the 2003 “Grand Bargain” proposal, which attempted to resolve with the United States issues spanning terrorism to regional security to Iran’s nuclear program. The Bush administration swiftly rejected this proposal, but Zarif is widely respected by officials in the US government and analytical community. Because Zarif is considered a pragmatist and technocrat, President Rouhani’s decision to appoint him as foreign minister has been characterized as an “olive branch” to the West. After a brief stint as Foreign Ministry spokesman, Araghchi (or Araqchi) was named Iran’s deputy foreign minister for legal and international affairs after Rouhani’s election. He doubles as deputy nuclear negotiator. Hamid Baeidinejad: Director general of political and legal affairs at the Foreign Ministry and head of the technical “expert” delegation. Davoud Mohammadnia: Legal adviser to Foreign Minister Zarif. Mohammad Amiri: Director general for defensive affairs at the Atomic Energy Organization of Iran. Having worked for several Iranian administrations, Salehi is considered an experienced pragmatist and technocrat supported by reformists and hard-liners alike. Ahmadinejad’s former foreign minister, Salehi is now head of the Atomic Energy Organization of Iran (AEOI). Fluent in English, Salehi received a PhD in nuclear engineering from MIT in 1977. On November 11, 2013, Salehi inked a deal with IAEA that would allow the nuclear watchdog agency “managed access” to the Arak heavy-water production plant and Gachin uranium mine. A nonproliferation an disarmament expert, Reza Najafi was named representative of Iran to the International Atomic Energy Agency (IAEA) in August 2013. A veteran cabinet minister, first appointed to government service by current Supreme Leader Ayatollah Ali Khamenei during his term as president, Zanganeh serves as oil minister in President Rouhani's cabinet. It is his second stint in the post, having served from 1997 to 2005 in the Khatami administration. Zanganeh described his role as being Iran's "second foreign minister," campaigning to increase sales of Iran's most important exports through energy diplomacy. Zanganeh has also butted heads with members of the previous administration, accusing Ahmadinejad allies and IRGC members of enriching themselves through their control of the oil industry. That said, Zanganeh is no stranger to allegations of corruption. As the diagram below demonstrates, factional dynamics can be mapped on two central axes: the republican-theocratic continuum on the y-axis and the economic continuum on the x-axis. The former captures positions regarding the ideological legitimacy of the regime—whether a more predominant position is given to the divine legitimacy of the state or to its popular legitimacy, both representing the twin pillars of state legitimacy. The x-axis concerns the economic dimension in which those on the left are supportive of state economic redistribution and intervention, while those on the right favor a smaller state and a more laissez-faire capitalist model of state-economy relations. This two-by-two matrix creates the conceptual space to identify the four main Iranian political factions since the revolution: the theocratic left, the theocratic right, the republican left, and the republican right. The labels in the parenthesis (i.e. reformists, hardliners, etc.) in the diagram allude to identity markers used by the media to label factions but are not consistent or systematic. As such, they do not clearly map on to the main classification used below (i.e. the theocratic-republican and economic left-right matrix) but rather provide a roadmap of comparison between colloquial markers and this more systematic classification. *This classification is discussed in further detail in: Payam Mohseni, “Economic Privatization, Factional Politics, and Regime Transformation,” in Power and Change in Iran: Politics of Contention and Conciliation, eds. Daniel Brumberg and Farideh Farhi (Indiana University Press, 2016), 36-79. The republican left quadrant represents the core conceptual space where the reformist forces belong. Reformist ideas have given primacy to the republican ideals of the state including popular sovereignty and a prominent role to the state in the economy, resulting in their positioning on the left of the economic spectrum. In the 1980s, these forces were amongst the most radical revolutionary groups and were known for their economic and political fervor. Over time however, many but not all reformist elites have slowly abandoned or changed their positions, including on the economy, as they have largely shifted to the right. Key figures on the republican left are the green movement leaders Mir Hussein Mousavi and Mehdi Karroubi. Mohammad Khatami is also associated with the republican left, although he has shifted his economic positions substantially. The republican right quadrant represents the ideals of much of the technocratic class of the Islamic Republic—the camp from which the current President Hassan Rouhani hails. As republicans, they give greater weight to the popular roots of the Islamic Republican than its divine sacredness, and economically espouse views more similar to economic neoliberalism more in line with a China-model of development. Another key figure in this camp besides the president includes Ayatollah Hashemi Rafsanjani, and the Kargozaran party is one of the main parties within this faction. The theocratic right quadrant comprises the traditional core power base of the Islamic Republic of the clergy and the bazaari merchants. The divine legitimacy of the regime is paramount, and economically they prefer less state regulation of the economy—though not necessarily neoliberal policies as they prefer state protectionism too for certain import mercantile arenas. Key figures include Ali Akbar Velayati, Ali Larijani, and Mahmoud Hashemi Shahroudi. More recently, as will be discussed later in this report, a “modern” sub-faction of the theocrats has emerged, spearheaded by Ali Larijani. The “modern theocrats” are more pragmatic in their ideals of how to interact with the world and structure the regime’s relations with society—breaking with more hardliner forces within the theocratic right camp, including staunchly backing the nuclear agreement. Technically, however, individuals considered “hardliners” represent elements that span across both the theocratic right and left factions. The theocratic left quadrant represents the populist Islamic factions where many of the core believers of the Islamic Republic are situated, hailing namely from the Basij and IRGC. They place greater credence upon the divine basis of the regime and are supportive of state intervention and redistribution in the economy. Former President Mahmoud Ahmadinejad is a key personality of the theocratic left camp. While many of the values and ideals claimed by the Supreme Leader also lean toward this camp, Ayatollah Khamenei tends to balance and shift between the two theocratic camps depending on the political circumstances of the time. What impact has Rouhani's election had? Hassan Rouhani’s surprise victory in the June 2013 presidential elections has brought hope for moderation of Iran’s nuclear policy. Rouhani, who campaigned on promises of reform and shedding Iran’s international isolation, is seeking to ease the nuclear standoff in an effort to relieve sanctions, improve the economy, and strengthen his hand against other factions in Iran. (However, it is important to note that the supreme leader is still the ultimate decision maker in foreign policy and nuclear negotiations.) Rouhani’s election also provided a safety valve for a public distressed by years of economic malaise and isolation. According to Belfer Center Fellow Payam Mohseni, the moderate cleric owes his victory in large part to a “divide within the conservative forces of the Iranian establishment” induced by a failing economy under President Ahmadinejad, as well as a last-minute boost in support from Iran’s center-right and reformist factions. By placing sanctions relief and challenging negotiations with the West at the top of his agenda, Rouhani risks failing to maintain the fragile alliance of constituents who delivered his election. Among its immediate neighbors, Iran is surpassed in size only by its Saudi rivals across the resource-rich Persian Gulf. Tehran, Iran’s largest city and capital, is situated at the foot of the lofty Elburz Mountains, with the vast desert landscape of the Dasht-e Kavir and Dasht-e Lut unfolding to the south and east. A two-hour drive south of the capital, the holy city of Qom is both a venerated pilgrimage site for Shi’a Muslims and the site of a nuclear enrichment facility (Fordow) at the center of the international debate over Iran’s nuclear program. Another three-hour drive leads to Isfahan, Iran’s third-largest city and site of the country’s only uranium-conversion facility. The vast Zagros Mountains to the west separate the dry basin of central Iran from the country’s 900-mile border with Iraq. This region of western Iran, home to the majority of the country’s seven million ethnic Kurds, was ground zero for an eight-year war with Saddam Hussein’s Iraq. While Iran does not directly border Syria, the theocratic regime in Tehran is widely suspected of using Iraqi airspace to transport cash, military equipment, and personnel to Bashar al-Assad’s government in Syria. To the north, Iran shares territorial rights to the world’s largest lake—the salt-water Caspian Sea—with four other oil- and natural gas-exporting countries: Azerbaijan, Russia, Kazakhstan, and Turkmenistan. Near the Iranian border with Turkmenistan lies Iran’s third-largest city Mashhad, a major economic hub along the famed Silk Road. Located immediately to Afghanistan’s west, Iran played a critical role in establishing an interim government in Kabul after U.S.-led military action removed the Afghan Taliban from power in 2001. Wedged between the Gulf of Oman and the remote border with Pakistan in Iran’s southeast corner lies the country’s equivalent of the “Wild West”—Sistan-Baluchestan province. At its southern-most point, Sistan-Baluchestan lies nearly 1,200 miles from Tehran—eclipsing the driving distance between Washington, DC and Kansas City, Missouri. Finally, the lifeblood of Iran’s economy—commodity exports—depends heavily on the country’s claims to much of the Persian Gulf. Iran boasts the fourth largest proven crude oil reserves in the world, as well as the world’s second largest deposits of natural gas. Columbia University’s Gulf2000 project is an excellent source for maps of the region. 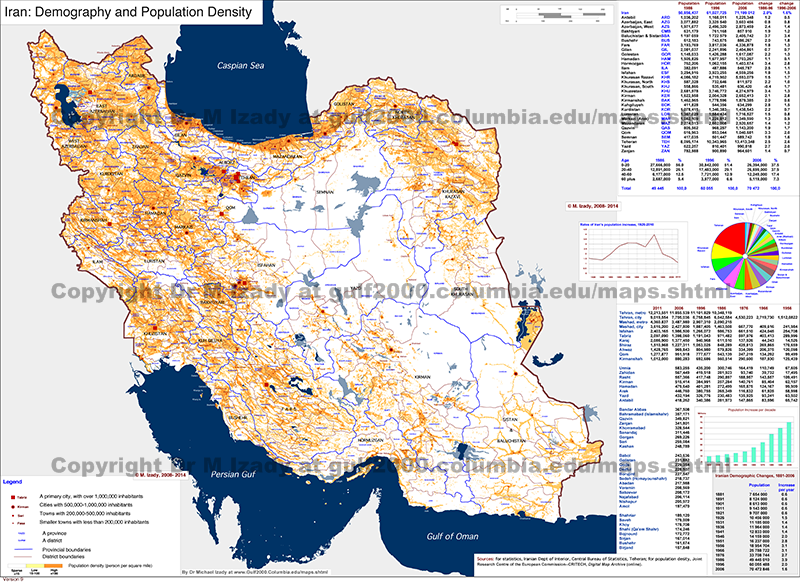 Among the highlights is a colorful feature mapping the ethnic groups of the Middle East, as well as maps charting the languages, religious composition, and population density of Iran. BBC’s “Iran in Maps” feature, though slightly dated, allows visitors to explore Iran’s population centers, transportation networks, nuclear and energy infrastructure, and demography. On the nuclear question, BBC and The Economist map the locations of Iran’s nuclear sites, as does Google Maps and the Nuclear Threat Initiative. For visual representations of fossil fuel reserves in the Persian Gulf and the region, check out the following maps by the U.S. Energy Information Administration and Gulf 2000. Yasmin Alem, "Duality by Design: The Iranian Electoral System"
Daniel Brumberg, "Reinventing Khomeini: The Struggle for Reform in Iran"
Mehdi Moslem, "Factional Politics in Post-Khomeini Iran"